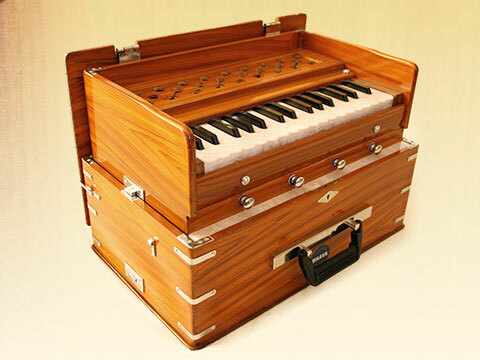 The Bhava Mini is the same style harmonium as the Classic, with 2.5 octaves of keyboard instead of 3.5. This saves a lot on size and weight, while leaving plenty of range for the chords and melodies of kirtan songs. These are built in Delhi, India, then expertly set-up by instrument specialist Nic Dillon. They feature a long bellows sustain with full tone, a rare feat for a mini harmonium! Solid wood is finished in a natural lacquer, with slight variations in grain and hue. These conveniently fold up for carrying like a suitcase, and a padded fabric carrying case is included. instead of the buy button above. Bhava is Sanskrit for the mood of devotion. Through kirtan, this feeling of bhava expands, becoming the ecstatic mood of awakened union. 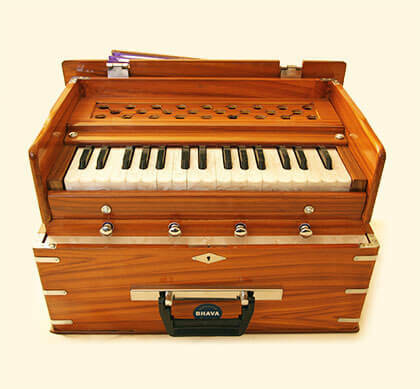 For us kirtan lovers, a harmonium is like a sweet companion, always beckoning us home to our chant practice, and gently supporting our singing with its lush vibrations. Nic Dillon, who created Bhava harmoniums specifically for kirtan musicians, is a kindred harmonium lover. Where I took the path of music teacher, he took the path of instrument specialist and curator, so it's super joyful for us to team up here to ensure that our community of chanters are getting the best harmoniums possible. There are many brands of Delhi-style harmoniums, including Bina, DMS, and others. 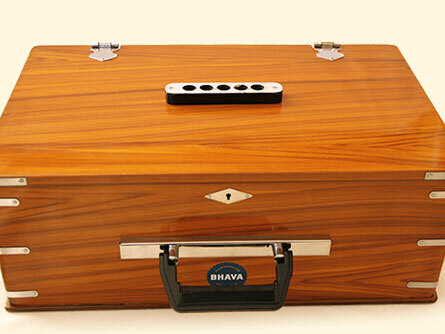 What sets Bhava apart is a premium build quality, premium reeds and finish quality, and thorough, expert set-up by Nic. The difference is significant. Nic is a humble, hard-working guy who wouldn't say it himself, but in my eyes he is the most dedicated harmonium specialist in America. Nic spends many hours adjusting each harmonium he receives from India, putting each through a set-up process that corrects leaks, adjusts key springs, refines reed tuning and gapping, repairs blemishes, and a long list more. He tells me, "My goal with each instrument is to make it as good as possible, and in the end, if I am happy with my work, that instrument goes up for sale. If I'm not happy (which generally takes at least 4 hours to discover), and the instrument I am working on is just not going to make the cut, it is used for spare parts, which are eventually used for the benefit of another instrument - so not all is lost." Well, his hard work and high standards pay off! These harmoniums look and sound great. They're what I play now, and I am very excited to connect more chanters with these fine instruments. May they serve you for many years to come!